Josephine Tey was a pseudonym for Elizabeth Mackintosh(1896 ‘“ 1952). She was a Scottish author who wrote mainly mystery novels (see the list at the end of this post). I read The Daughter of Time some years ago and thought it was an excellent book, a mix of historical research and detective work. Inspector Alan Grant is in hospital and to keep his mind occupied he decides to discover whether Richard III really did murder his nephews ‘“ the Princes in the Tower. I’ve also read The Franchise Affair, which I thought was also an excellent book. I bought Miss Pym Disposes at the local village hall when I went to vote in the European Election in June 2014. There was a table full of books for sale ‘“ nothing to do with the election, but a bonus for me! Based on the other two books I’d read by Tey I thought it would be a good buy. And it was. It is set in the 1940s and was first published in 1946. 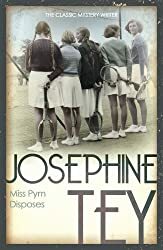 I knew from the synopsis that Miss Pym was pleased and flattered to be invited to Leys Physical Training College to give a lecture on psychology. But then there was a’nasty accident‘. So I was wondering about that ‘nasty accident’ as I began reading the book – who has the accident and is it really an accident, and if so who was responsible for the accident? It all seemed to be plain sailing until something happened that nobody expected and it was that that triggered the ‘accident’. It was intriguing and very cleverly written. There is a long build up to the accident. Miss Pym had been a French teacher at a girls’ High School until she inherited some money, left teaching and wrote a best-selling psychology book. She was invited to Leys by her old school friend, Henrietta Hodge, the college Principal and stayed on there for a few days, that extended into two weeks as she got to know and like the students and the staff. However, she realises that all is not as perfect at the college as she had thought, alerted to that fact that when one of the students, Teresa Desterro, tells her that everyone is just a little bit insane in this last week of term – ‘It is not a normal life they lead. You cannot expect them to be normal.‘ Miss Pym observes how strenuous their studies are and the stress and anxiety the senior students go through in their final exams and learn where Henrietta has found jobs for them, or if she has found jobs for them. This is not a conventional crime fiction novel. It’s a psychological study focussing on the characters, their motivation and analysis of facial characteristics. It looks at the consequences of what people do and say and, as Miss Pym discovers who she thinks is responsible, it also looks at how much a person should intervene, or as one of the characters tells her, ‘Do the obvious right thing, and let God dispose.’ Miss Pym agonises over her decision, was she really going to condemn someone to death? I thoroughly enjoyed this book, such a delight to read, a book that is beautifully written. I thought the slow build up to the ‘accident’ was perfect and I kept changing my mind about who would be involved – and it has such a good twist at the end. It is the ideal book for these challenges: Bev’s Mount TBR Reading Challenge, her Vintage Mystery Cover Scavenger Hunt in the category ‘More Than Two people’, and Peggy Ann’s Read Scotland Challenge. Claverhouse (1937) (writing as Gordon Daviot) A biography of John Graham of Claverhouse, 1st Viscount Dundee (1648 – 1689), known as “Bonnie Dundee” after leading the Jacobites to victory at the Battle of Killiecrankie in 1689, in which he lost his life. Oh, this is a great book, isn’t it, Margaret? And you’re right; it’s much more of a psychological mystery than it is anything else, really. I think it’s a fine depiction of the school environment, too. I thought this was superb – I wish she’d written more novels starring Miss Pym! Like many other people, I read The Daughter of Time when I was at school, the ignored Josephine Tey for decades. But over the last few years I’ve read most of her novels, and thoroughly enjoyed them. They all seem to be psychological thrillers, with unexpected twists. Try Brat Farrar… or A Shilling for Candles… or To Love and Be Wise.. Or any of them really. I have A Shilling for Candles waited to be read – looking forward to it! I enjoyed this mystery very much too when I read it a few years ago. I had only ever read Daughter of Time so it was interesting to see what else Tey could do. Now you’ve prompted me to try to get another of her books — I need something for the Back to the Classics detective category and Alan Grant definitely fits the bill.